(TORONTO, ON – FEBRUARY 13, 2017) Discover what drives you forward, in the Toyota exhibit at the Canadian International Auto Show – February 17-26, 2017 at the Metro Toronto Convention Centre. First on Toyota’s list of not-to-be-missed attractions is the all-new, eighth generation 2018 Toyota Camry (and Camry Hybrid), the best-selling car in its segment in Canada for the past two years. Featuring everything you’d expect from its proven, safety-focused reputation, it now features a jaw-dropping new design backed by now-standard sophisticated safety features, impressive technology and stirring performance. The new Camry utilizes TNGA (Toyota New Global Architecture) which represents a completely new strategy to the way the company designs, engineers, and packages its vehicles to ensure they’re more dynamic, fun-to-drive and athletic than ever before. 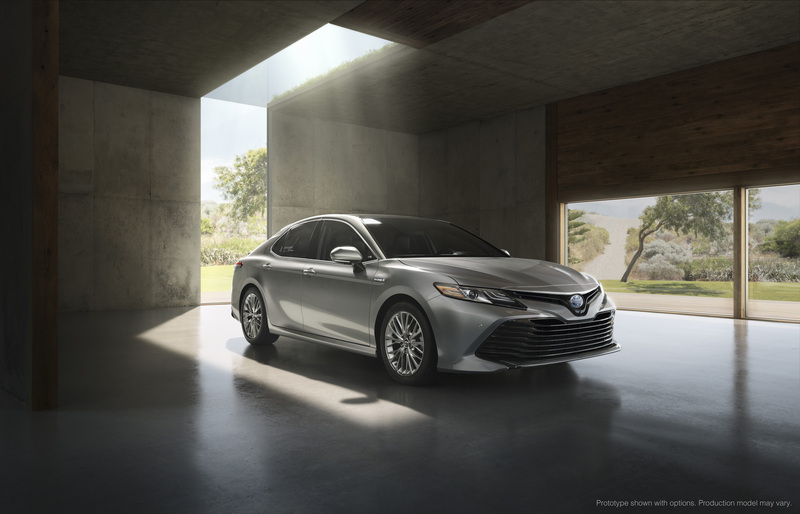 At a glance, it’s clear that the design goals for the all-new Camry of a distinctive, low centre of gravity resulting in a firm wide stance and sleeker profile, a practical-yet-emotionally styled cabin and a sporty yet upscale image both inside and out have been achieved and truly set a new standard in the midsize-sedan category. Available in five grades (the L, LE, XLE, SE and XSE) and three new powertrains, there’s a Camry that’s right for anyone considering a mid-sized sedan. In addition, a next-generation hybrid system (THS II) has also been engineered for the 2018 Camry Hybrid to provide the ideal balance of energy efficiency with superior power output to maximize driving performance and enjoyment while also poised to achieve best-in-class fuel economy ratings. Of course, at the core of every Toyota vehicle is the commitment to safety, and the all-new 2018 Camry is no exception. Among the many safety features on the 2018 Camry is standard Toyota Safety Sense™ P (TSS-P). This multi-feature advanced active safety suite bundles cutting edge active safety technologies including Pre-Collision System with Pedestrian Detection (PCS w/PD), Full-Speed Range Dynamic Radar Cruise Control (DRCC), Lane Departure Alert with Steering Assist (LDA w/SA); and Automatic High Beams (AHB). Select models will also come with standard Blind Spot Monitor (BSM) with Rear Cross Traffic Alert (RCTA). The Canadian debut of Toyota Entune – a bundle of connected vehicle technologies designed to offer convenience and peace of mind for drivers, via simple and seamless synchronization. These technologies include App Suite, enabling access to popular apps, plus enhanced navigation and mapping and Destination Assist – a live agent service ready to assist drivers with the push of a button. And finally, Safety Connect, provides Automatic Collision Notification, Emergency Assistance, Enhanced Roadside Assistance and Stolen Vehicle Locator automatic notification of a collision to dispatch emergency support. Entune comes to Canada this year, starting with the new Toyota Camry. The Toyota FCV Plus Concept. This hydrogen fuel cell concept expresses Toyota’s vision to help decarbonize the auto industry. The Toyota FCV Plus Concept vehicle also functions as a portable generator – able to power a home, or join forces with other FCV Plus Concept vehicles to provide clean energy for an entire community. In addition, the Toyota exhibit will have a full range of vehicles on display – including the Toyota Prius Prime, the Toyota Corolla sedan and Toyota Corolla iM hatchback, the updated Toyota Highlander midsize crossover, the refreshed Toyota Sienna minivan, the Toyota 86 authentic sports coupe, the Toyota TRD Pro family of trucks factory-customized for extreme off-roading, and more.